The EQ Asset Allocation Committee met on 30 October 2018. In this document we outline our investment position on each of the major world markets and summarise the changes we have made to client portfolios in this quarterly rebalance. Please note: our views may change at any time. The overall structure of any portfolio is determined by its risk profile, and our views will influence your portfolio based on its default positioning: please see page 6 for details. Kasim graduated with a BSc (Hons) in Physics from Imperial College and is a CFA charter holder, being a regular member of the CFA Institute and CFA UK. He began his career in investments in 2002, gaining experience as a portfolio manager and senior analyst of global capital markets. His experience spans multiple asset classes, constructing portfolios with varying risk/return objectives and active risk management processes. 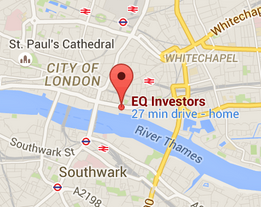 Kasim is the portfolio manager for the EQ Investors Best Ideas and Absolute Return portfolios. He is an active member of the investment management, strategic asset allocation and fund selection committees. When not immersed at work, Kasim often finds himself stumped and constantly amazed by his young daughter at home. He also enjoys spending time in the kitchen practising his “cheffy” skills with both European and Asian cuisine, reflecting his mixed background.